The genus Libellula is mostly New World, but also has one of the few endangered odonates from Japan: Libellula angelina. Many of the members of this genus are brightly colored or have banded wings. The related genus Plathemis includes the whitetails. The genus Celithemis contains several brightly marked species in the southern United States. 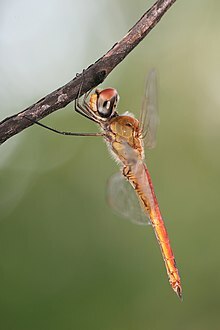 Members of the genus Sympetrum are called darters (or meadowhawks in North America) and are found throughout most of the world, except Australia. Several Southern Hemisphere species in the genera Trithemis and Zenithoptera are especially beautiful. Other common genera include Tramea and Pantala. The order name may have been derived from the Latin libella which means "booklet". ^ Rambur, Jules (1842). Histoire naturelle des insectes. Névroptères (in French). Paris: Librairie Encyclopédique de Roret. pp. 534  – via Gallica. Martin Schorr; Martin Lindeboom; Dennis Paulson. "World Odonata List". University of Puget Sound. Retrieved 11 August 2010.